Humans may have acquired enzymes that make blood groups from bacteria to hinder the spread of viruses in the population, suggests a study. 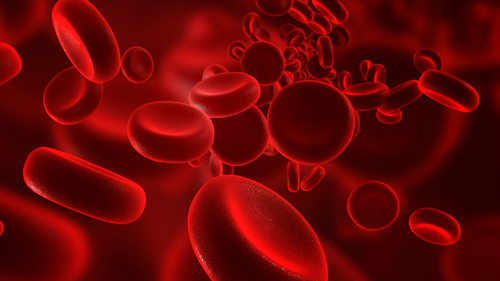 Red blood cells are covered with carbohydrate structures called glyco-antigens, some of them vary between individuals and are classified into blood groups A, B and O. Humans who are A positive have antibodies against blood group B glyco-antigens, B positive individuals have anti-A and O individuals have both anti-A and B. The antibodies are absent from new babies but are produced through exposure to intestinal bacteria that produce blood group antigens. Enveloped viruses carry a piece of their host’s cell membrane containing blood group antigens, so that if a virus coming from an A positive individual infects a B positive or O individual it is killed by the immune system while viruses from a B positive individual are killed when they infect an A or O individual. The glyco-antigens are made by a group of enzymes called glycosyltransferases. Professor Ravi Acharya’s group (Bath), in collaboration with Professor Keith Brew (Florida Atlantic University, USA), studied the 3D molecular structure of a glucosyltransferase enzyme from the gut bacterium, Bacteroides ovatus. They found that the bacterial enzyme has a very similar structure to the mammalian version of the enzyme, despite having major functional differences. The study shows how the mammalian enzyme may have evolved from the bacterial one by horizontal gene transfer – skipping the species barrier – rather than by vertical gene transfer from generation to generation. Ravi Acharya, Professor of Structural Biology at Bath, explained: “The bacterial enzyme is interesting because, unlike the human version, it doesn’t depend on a metal ion to function. “We were therefore surprised that it would still have a strikingly similar 3D structure to the human enzyme. The research, published in Nature Group journal Scientific Reports, was supported by the Wellcome Trust.